Having good On-Page SEO is the key to being found online. This article will introduce you to On-Page SEO and the basic guidelines I share, will help you better optimize your website. Anyone hoping to achieve success on the web must first be found online. The key to being found online is making sure your website shows up in these top search engines: Google, Yahoo and Bing. However, not only must your site be found in these search engines, but it must also rank high in their search results, ideally on the first page and in position number one. Only websites optimized for search rank high and the science of optimizing a website is called SEO, which is short for Search Engine Optimization. SEO involves making changes (or tweaks) to each page on your website so they rank high in search engine results. 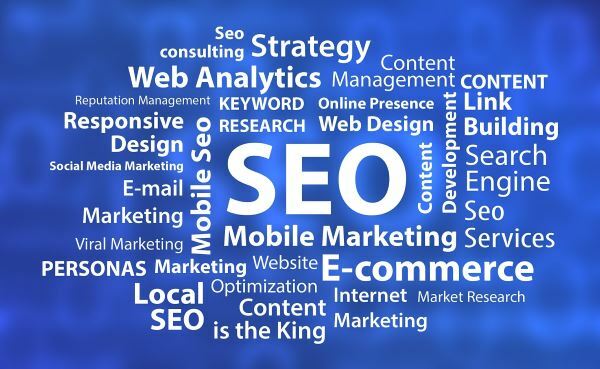 There are three areas of SEO a site owner needs to be aware of if their website is to have any chances of being found and ranking well online, they are: On-Page SEO, Off-Page SEO and Technical SEO. This article will highlight some basic guidelines on how to achieve better On-page SEO. Some of the elements, like the content are visible on the page, while others are hidden behind the scenes. Some elements, such as the meta data can’t actually be seen unless you are viewing the source code. To view the source code of a web page, Right click within the body of the web page and select “View page source”. Content, meaning the text on the page is the most important on-page element. Your page must contain good, well written, value-added content that is unique from other content already on the web. While search engines such as Google do not officially say how many words your content/article/blog post should be, without a sufficient amount of content on your page, it will very difficult for your page to rank. It’s also, important to perform some form of keyword research before you begin to write your content. As you develop your content, a good exercise that I tend to use, is to read the content out loud. If it doesn’t sound good to you, it probably will not sound good to others. You should also, use images and videos to further enhance what you write. It’s also a good idea to link to other sites that include additional resources that help support your content. Optimizing the page meta data involves making changes to the page titles, page descriptions and also, using a header and sub-headers in the body of your article to help the flow and readability of your content. 2. It also serves as an inducement for a searcher to click-through when viewing SERPs or search engine results pages. The title tag should clearly describe what your page is about. It should also include keywords that a searcher is most likely to use when using a search engine. 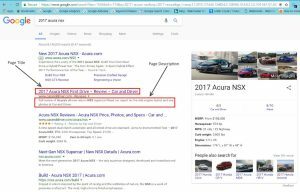 In addition, a best practice is to have that keyword show as close to the front of the title as possible while sounding natural. Note: You can view the title in two places: 1. usually on the top tab of the browser and 2. as a meta tag in the source code of your web page. You can also view the title tag by using a browser add-on or plugin application. The title tag should be no longer than 55-60 characters. Google will generally truncate (cut-off) tags that are longer than 60 characters. I recommend that your title tag be no longer than 55 characters. Can I use My Business Name in the Page Title? Most SEO professionals would (should) discourage you from using only your business name as the title page and on every other page, especially when implementing a new website. This is one thing many people tend to ignore. Truth be told, people hardly care for the name of a business unless it provides the products or services they need. It is only upon confirmation of this that they take note of or bookmark the name and address of a business. While it is essential to give a name to a business, especially for branding purposes, doing so can be a waste of keyword space unless the business name is itself a keyword-optimized name. 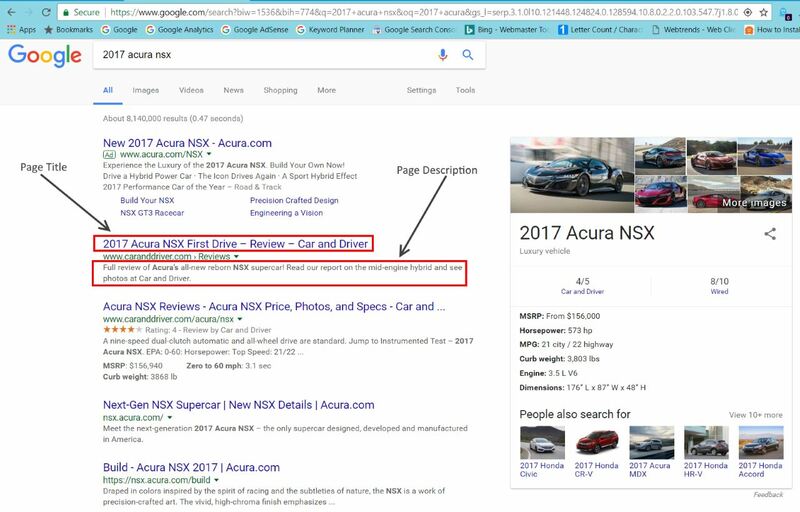 The page description tag, usually referred to as the meta description, is the block of text that is shown below the Title tag and the URL in search results. The meta description is used to describe what the web page is about. It should also be written in such a way that the visitor will want to click on your result to learn more. 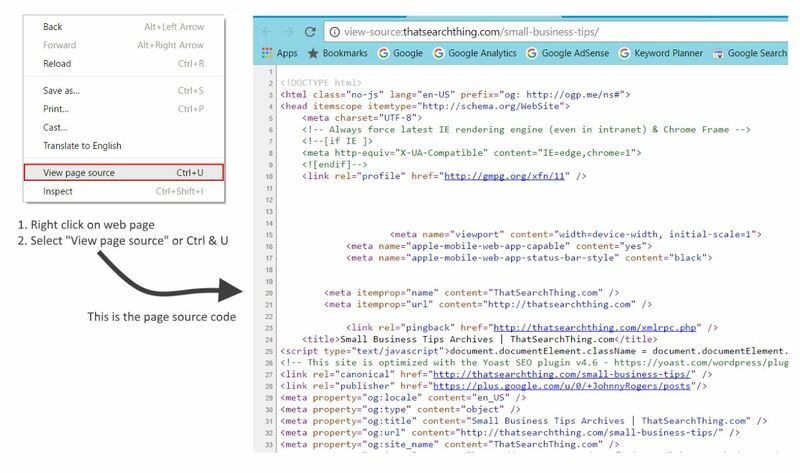 The meta description cannot be visually seen on the page, it is only visible during search results, but can also be seen when viewing the source code of a page. Most search engines allow no more than 140-160 characters to create the description. For example, the ideal length for Google is approximately 155 characters. Please note that page descriptions can be longer but the search engines will usually truncate (cut-off) the description if it is longer than the required limit. In cases where a page description has not been created, search engines will usually attempt to create a description based upon the content on the page. This sometimes results in a poor description which leads to a bad user experience for the searcher and no click-through for you. So it’s important that each page of your website has a unique page description. It is not considered in ranking but is key for user click-through and the better it is written, the greater the chance a searcher will click on your result and visit your web page. 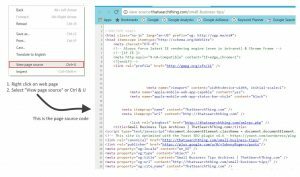 H1, h2 and h3 headers are tags that help search engines break down the sections of your content. Content headers and sub-headers are also, used to help a reader scan your article and tell what the general theme or topic of your page is about. For example, this article uses an h1 header along with h2 and h3 sub-headers to help show the different sections of this article. If you were to examine this page by using the “View page source” command, you would see each of those headers at work. H1, H2 and H3 header tags are very important in the world of SEO. The major search engines pay special attention to these headings and by you using them, they can help to make your content easier to read for visitors. Ideally you should be using keyword phrases in the title, page description and throughout your content. Even before you begin to write your content you need to research the phrases (words) that someone using a search engine would type to find your website. it’s those keywords that help the search engine determine if your web pages are relevant to a particular search. The keyword phrases should always be relevant to what your article is about and your content/article should be written so that your keywords appear in the body of that content naturally, without sounding mechanical. The key phrase or focus keyword in the title tag should describe the website in general. You want to also write a compelling page description which also, includes the focus keyword. The Meta Keyword Tag is not a ranking factor for SEO, but it helps to set the stage for the content topic. While other smaller or lesser known search engines may still use keywords as a factor, the three major search engines Google, Yahoo and Bing no longer use the keyword tag as a ranking factor. The keyword tag is no longer needed, but if included can quickly give another content writer (and unfortunately your competitors) a general ideal of what the topic of your web page is about. By using a free SEO keyword tool such as “Google Keyword Planner” or commercial tools like SEMrush and WordStream you can easily find quality keywords that people are using to find the topic, products or services that you have written about on your website. Good On-Page SEO is not just a good thing to do, it’s a must if you ever want your website to be found and rank high enough to get free traffic from the search engines. I would also encourage to check out some of the articles below to learn how search engines work and why people use them. I just want to say that all the information you have given here is awesome… great and nice blog thanks, sharing.. This is good article. If you explained with some more details it could be awesome. update some details like the 1st page average web page content length in SERP now is 1800. Thank you for sharing your knowledge it’s helpful to new bloggers like me.